These wooden, unit blocks are an open ended construction resource. The wooden blocks are made from smooth timber. The unit blocks develop spatial awareness and imagination. The set is specifically designed to be used by 5 children at a time. Set includes 56 pieces. Suitable for children from the age of 3 years. Unit blocks and project blocks are based on the proportions 1:2:4. This unit based measurements of halves, doubles and quadruples, combined with columns, ramps, curves, buttresses and other specialised shapes, lay the foundations for basic maths and also geometry. The unit blocks have a depth of 3.2cm. Unit blocks allow children of different ages and levels of learning to create, solve problems, and challenge themselves through play. These blocks encourage children to recreate structures, cities and landscapes from everyday life. Balance and collapse teach the nature of gravity, and basic maths is found as children add, subtract and multiply the blocks. Ramps and columns can be used to make simple levers and fulcrums. As a result, socially, block play encourages children to make friends, work in a group and cooperate with each other. 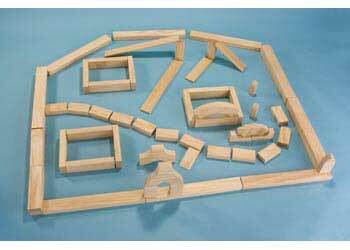 Block play can also help to promote language and communication skills, as young children describe and play with their constructions. 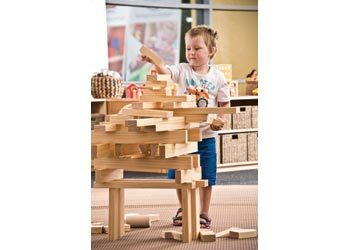 While creatively, blocks allow children to design their own constructions and build their own original designs. 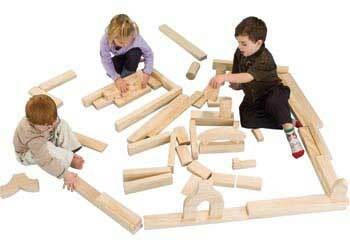 The blocks can also be used in dramatic play, a simple block can represent almost anything in creative play.